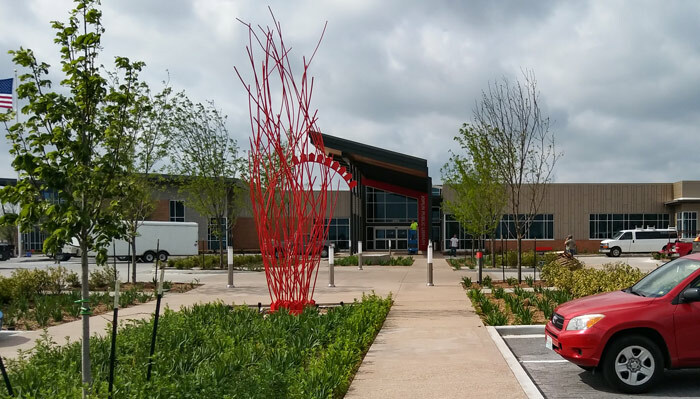 JOPLIN – As a testament to Joplin’s continued resiliency after the community was devastated by an EF5 tornado in 2011, residents will celebrate the grand opening of Joplin’s new public library with a celebration on June 3. The new library is not just a symbol for the city’s rebirth, it’s also a cultural center and catalyst for economic development at the “center of it all” with spaces indoors and out to gather, imagine, explore, learn, and be entertained. Sapp Design Associates Architects of Springfield, Missouri and OPN Architects of Cedar Rapids Iowa collaborated on the design of the new library. The Architectural planners collaborated extensively with as many as 23 different Joplin user groups by leading community focus sessions, surveys and panel discussions from leading library directors across the United States to develop a design that fulfilled its goal for the library to be used in new and unimagined ways. The result was a size increase from 35,000 sf to 57,800 sf to provide room for expanded services and community flex space that promotes the concept of a Next Generation Library. Starting with an exciting and playful modern exterior the design prompts a retail-like transparency into the building’s interior showcasing various activities happening inside. Along the well-traveled 20th street, the building takes on a sweeping, elegant form consisting of a community storm shelter bordered by light and airy roof forms reminiscent of butterfly wings. The gently sloping roof planes appear to float as they are supported by an intricate array of steel framework. The storm shelter, however, is given a sense of permanence, clad in a textured armor of aluminum plate panels. From the parking lot, a warm, wood lined canopy extends out to welcome patrons. The structure, left exposed, frames the entrance pathway and continues into the lobby. The entrance lobby marks the transition from the exterior and is accented by a linear skylight that permits cascading, natural light down the west wall. A shortened ceiling separates the entrance lobby from the open concourse and enhances the experience of movement toward the inviting, open common space. The interior design includes a large central lobby that serves as community gathering space. On each side of this lobby are exterior courtyards, one enclosed and the other open to the public with an adjacent outdoor learning classroom and sculpture lawn. Inside, a community room also serves as a storm shelter and other centrally located meeting and community spaces fulfill the city’s collective goal for the library to be a community hub. The makerspace houses a 3D printer, lasers for etching, engraving, and cutting, as well as equipment for digital media conversion. A Lego wall encourages budding engineers. The children’s area is interactive in other ways, too, with a mural reflecting favorite children’s titles. Modern décor in the Post Library complements what will be a rotating art gallery leading to a meeting room for up to 200 people, which can be booked online. The Joplin Public Library was honored for excellence in architectural design with a Public Design Award at the biennial Springfield AIA reception and design awards program in May 2016. Projects are judged by a jury of architectural professionals and a separate public jury consisting of a group of community leaders, arts professionals, and local academics. Sapp Design Associates Architects is a Springfield, Missouri based Architecture firm with more than 30 years of experience designing award-winning public buildings across the Midwest. The Firm’s work encompasses Public Libraries, K-12 Education, Higher Education, Recreation, Civic, and Corporate projects. To learn more about Sapp Design Associate Architects, visit www.sdaarchitects.com. .